One of the many ways to save money on food is to bake your own bread. This is something I haven’t explored much with in the past, but since moving back to the States, breadmakers are a dime a dozen. It didn’t take us two weeks to find a yard sale with a $1 breadmaker. Holla! Now, I know that it’s not crucial to have a breadmaker in order to bake your own bread, but wow it takes the mess and manual labor out of it. I’m still learning the quirky differences in the various types of flours and yeasts but I love the smell and texture of freshly baked bread right out of the oven. My husband has been doing his pizza dough in there now too, cheater. After the first few loaves of bread in the new-used breadmaker, I decided to revert back to a simple, no-fail, white bread recipe. It turned out amazing, with a beautiful crisp crust and soft, fluffy and warm inside. I was pretty proud of my bread machine at this point. One thing to remember about homemade bread is that it really doesn’t last more than 3 days, and even that 3rd day leaves you wanting it fresh out of the oven instead. Yes, it’s true, you become a bread snob shortly after learning to make your own bread, but why shouldn’t you? Your bread is better than the bagged crap at the store selling for too much money. 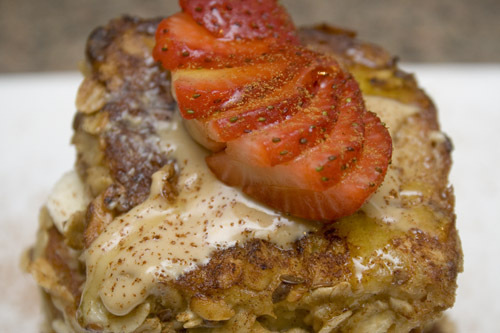 So, if you don’t eat all of the loaf by the third day and it starts to get hard, use it for French Toast. 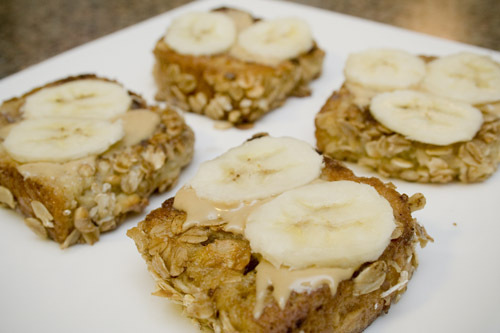 On a medium-sized plate, combine the oats, flax, and walnuts. Mix together with your hand until well-combined. 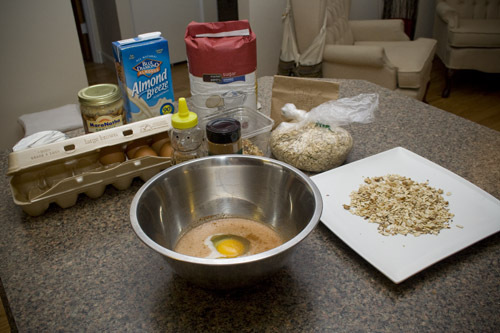 Dip the first 4 squares into the egg mixture and drag the sides through the granola mixture. Place them into the frying pan and let cook for 3-4 minutes until golden brown on the bottom. Flip with tongs and brown the other side. Remove from the pan and set on a clean plate. 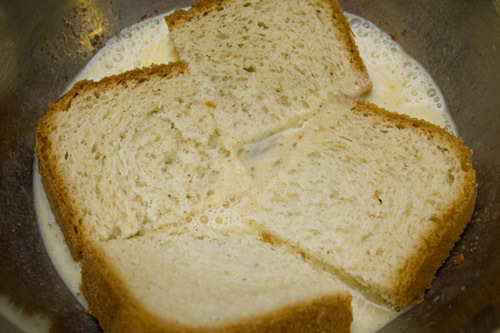 With the remaining 4 pieces of bread, repeat steps 3-6. While the 2nd set of French Toast squares are cooking, spread a teaspoon of peanut butter and two slices of banana on each of the finished squares and stack them on top of each other. Slice the strawberry thinly and place on top of the stack. Pour honey over the top and add a dash of extra cinnamon. 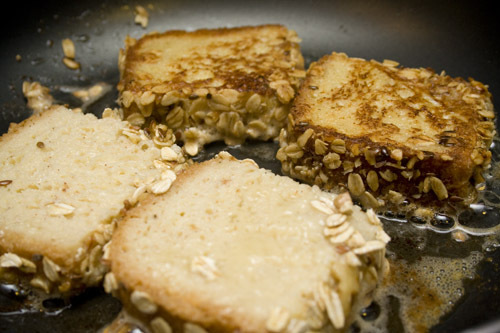 Repeat with the 2nd set of French Toast squares.